This site presents compendia of quotations. Each compendium treats of one of the ten terms shown in the menu at left. For each term there are two compendia: Confusions and Rejoinders. The term liberalism, for example, has a page for each compendium. The compendium Liberalism: Confusions presents, in chronological order, quotations by authors who use the term “liberal” or “liberalism” in ways that do not comport with the original meaning (the 1776-1876 meaning, as it were). The Confusions authors very often declare semantic innovation or quarrel with classical-liberal semantics. 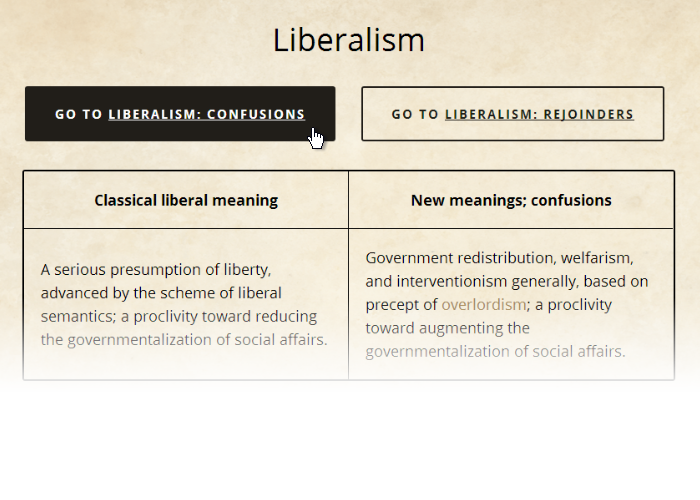 There follows the compendium Liberalism: Rejoinders, where authors who typically support classical liberalism take note of or remark on the semantic confusion about “liberalism.” They often deplore the new semantic practices. Such awareness validates the narrative, as a witness validates a story by giving testimony. This website shows a shift in meanings. Did it come by individuals changing their way of talking, or by new generations, which talked one way, displacing older generations, which talked another way? The quotations of the Generations compendium indicate the shift was primarily generational; there seems to have been few cases of individual classical liberals moving much in the statist direction.